We can’t believe how fast March is flying by! (We’re still recovering from St. Patrick’s Day music celebrations, to be honest.) But the beauty that stems from this month’s seasonal change –from winter to spring – is hardly over. The magic of March is evident in nature as well as our transitional fashion choices. And whether you’re a rebel Pisces chick (Feb 19 – Mar 20) or an awesome Aries girl (Mar 21 – April 19), showing your zodiac pride for the month of March is super-easy when you think in terms of colors and vibes. For a new direction in your fashion compass, consider dressing according to your zodiac sign with hints of your birthstone color and birth flower! Keep reading for styles that makes sense and ROCKS. Did you know that you share your birth month with these hotties? You may identify with Kat Von D’s occult fashion….or you may be drawn to the old soul and theatrical statements of Lady Gaga (ahem, her tribute look to the late David Bowie was incredible!) No matter which celeb March baby excites you the most; enjoy sharing your birth month with some of the coolest fashion trendsetters out there. 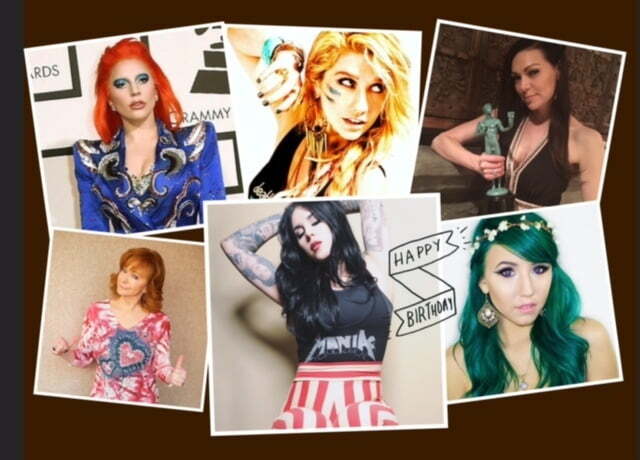 KE$HA (pop star), Kalel Cullen (YouTuber and beauty vlogger), Laura Prepon (award-winning television actress), and Reba McEntire (ageless country singer with a fiery red signature hair color and western style) are famous March babies who fearlessly explore their individual personal styles. Do you share their guts? For a casual day out, let us consider the versatility of edgy pants, such as distressed jeans, and a graphic tank top or black crop top. Whether you’re a Pisces chick who’s ready to work in hints of your aquamarine birthstone or you’re an Aries girl that’s all about accenting a simple outfit with shades of your carnelian birthstone….have fun! The shades and cuts of each stone are very unique, and actually do have quite a range in their quality and appearance. But finding accessories to accent white and denim or black and denim doesn’t have to be much of a challenge. Think in terms of blue and turquoise or blood red and burgundy hues as you create your own take on zodiac fashion. From earrings and bracelets to nail polish and punk rock shoes (love creepers! ), the color of your birthstone can be worked into an outfit that’s dressed up or dressed down! For the artsy and peaceful Pisces, a soft or edgy boho beauty look can be pieced together with colors from the water lily (especially if floral print dresses aren't your thing!) This white and yellow birth flower can come forth in a Pisces outfit when channeled with unique necklaces, floral hair accessories, and cute shoes. The feminine, delicate shades of the water lily also look great when paired with black for cool contrast. A pair of black pinup platforms or high-top sneakers both work with fitting dresses, while a black motorcycle jacket adds a rebel edge and makes for a good seasonal transitional clothing item. Never know – April showers could hit unexpectedly! When it comes to dressing according to your birth flower, sometimes it’s not that easy to find a print that is clearly based on a honeysuckle – the Aries’ birth flower. And if you're not into wearing a floral-print dress that clearly resembles the beautiful hues that make up a honeysuckle, set the pace with style and explore another type of eye-catching Spring dress! Determined and courageous, the Aries chick can often show off her trendsetting fashion sense in a flirty pink dress and tons of pink accessories or a bright yellow boho blouse with dangly green earrings! Whether you prefer a strong monotone statement or a combo of bright colors, you can still maintain your unique edge with black pieces. Think: a tassel faux black leather jacket, studded black boots, such as cowboy or gothic boots, or black strappy shoes! 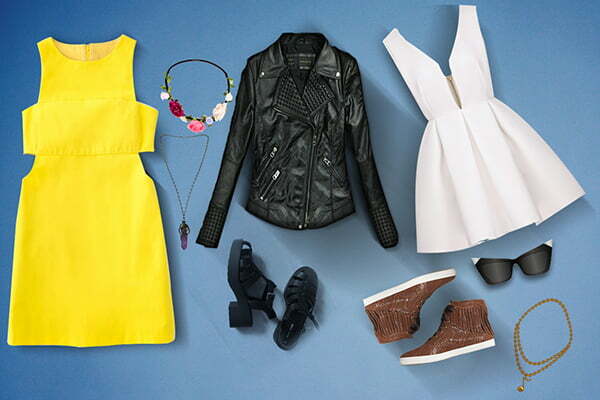 Do you dress according to your zodiac sign? Let us know how you show off your astrological awesomeness by leaving a comment below!